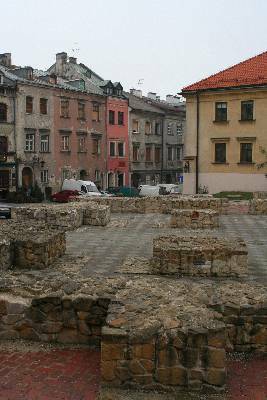 Articles with keyword "parish church"
Po Farze Square (Former Parish Church Square) in Lublin is one of the oldest parts of the Old Town in Lublin, hiding the relicts of buildings whose history reaches back as far as to the Middle Ages. The church of St. Michael that overlooked the square in the past was the seat of the first parish in Lublin and one of the key elements of the city’s panorama. Today, the foundations, uncovered and raised between 2001 and 2002, and a bronze mock-up that represents the appearance of the church in accordance with historical sources, remind of its existence.